Hands up if you enjoy being lectured to? I didn’t think so, so why is it that so many public speakers fall into the trap of conducting a monologue with their audience? Do they lack audience engagement ideas? Do you lack audience engagement ideas? Engagement starts with your desire to engage. Set aside your fears about grabbing and holding your audience’s attention. They are nothing compared the damage you do to your credibility if you don’t even try. In simple terms, engagement is when the people listening to your presentation do something as a result of your speech. This could be an external action such as raising a hand, clapping, nodding; or an internal action such as agreeing, becoming more curious, empathizing or feeling an emotional reaction to your message and its delivery. In this post, I’ll outline some powerful audience engagement ideas that anyone can use. Ask for an action to gain engagement and build rapport. Stories are memorable, especially ones that have a personal connection. Sharing your fear or excitement will engage your audience. It’s also a lot easier to come across as genuine if you are speaking about something you care about deeply. This works especially well if they seated for a long time. I remember once deciding to change my speech at the last moment because I felt that the audience energy was very low, probably because had been sitting all day listening to speaker after speaker, and I could just “feel” the boredom and fatigue. So I took a chance, walked out on the stage confidently and asked everybody in the room to stand up and have a stretch! And guess what, they all did, and I had their attention for the rest of my speech slot. Many presenters take questions reluctantly because they worry that an audience member will ask a question, to which they don’t know the answer. I find it useful to think of questions, not as threats, but as gifts. They are an opportunity to a) test the audience’s current reaction to the topic. b) Clear up any misunderstandings quickly. c) Give more relevant information. Try out these audience engagement ideas for yourself and see what happens. I know that you will be pleasantly surprised. P.S. I will be writing a second post with some more advanced techniques soon. 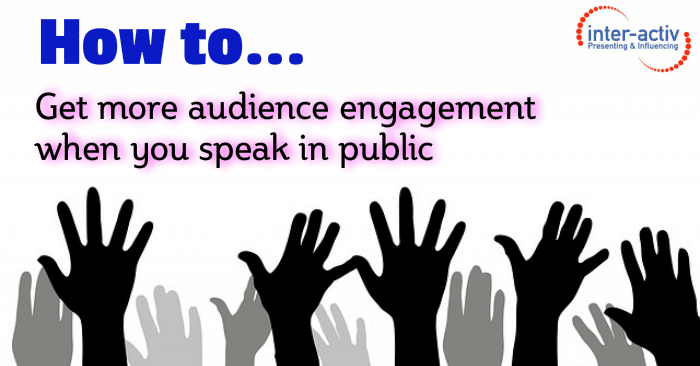 Help be by sharing your top audience engagement tips in the comment box below. I’ll use the best ones in my next post.